Liczba stron: 424 Jest to ujednolicona liczba stron, która ułatwi Ci porównanie długości książek. Każda strona Legimi to 200 słów. 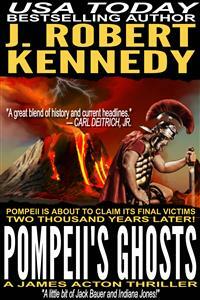 USA Today bestselling author J. Robert Kennedy delivers the historical drama and modern day action in Pompeii's Ghosts his fans have come to expect. Pompeii’s Ghosts opens with a shocker that will keep you on the edge of your seat until the thrilling conclusion in a story torn from today’s headlines. To Roman historians, the name “Pliny the Elder” is well known. A prolific writer with an impressive résumé, much has been learned about life and public administration in Ancient Rome thanks to him. His nephew, known as “Pliny the Younger”, is equally well known amongst volcanologists due to his detailed and horrific descriptions of the eruption of Mount Vesuvius, and the destruction it wrought upon Pompeii and other surrounding towns. His description was so memorable, he has been honored by history—forevermore shall the most violent of eruptions, such as that of Mount Vesuvius, be known as Plinian. His descriptions have been used throughout this novel to lend realism to the horror that befell twenty thousand people, too many of their ghosts still haunting the nearly perfectly preserved streets of Pompeii to this day. Though his letters to a friend years later are heavily relied upon, there is one glaring inaccuracy in his accounts that must be challenged. If Pliny the Elder was overcome by the gasses from the volcano, why weren’t the others with him as well? And if at least some of the others were able to breathe, what could possibly have been so urgent that they would abandon him, rather than take the few minutes to carry him to the waiting boats? It is a two thousand year old mystery that is about to be resolved. The ground shook with a rumble as if a beast contained under the marble floor was struggling to escape, its groan vibrating through the house as those lounging on the many cushions and silks jumped to their feet—some more spryly than others—and furtively glanced about, wondering what to do, fear evident in their eyes. And immediately identifying them as foreign to the area. For those who had lived near the Bay of Naples for some time, like Lucius Valerius Corvus, knew exactly what it was—just another tremor, the shaking of the ground a too often occurrence, though more frequent as of late. Instinctively he had placed himself in an archway with a hand gripping the stone for balance at the first hint, and now, as the ground beneath their feet settled, Valerius looked to his Lord and Prefect, Gaius Plinius Secundus, to make certain he was okay, then to their honored guest. The man who had asked the question. Emperor Titus waved the man off, having quickly recovered from the scare, he himself never thought of as a coward, having led many successful military campaigns, not the least of which was the defeat of the Jewish Rebellion. A man to show fear he was not, and in this case, all Valerius saw on his Emperor’s face was curiosity. Plinius nodded as he motioned for everyone to sit back down. All waited for their Emperor to do so first. Emperor Titus dropped onto the large cushions with the difficulty age and a life in the military inevitably brought. Taking a long drink from his goblet, draining it of the sweet wine it contained, he held up his cup and a servant rushed from out of sight, filling it almost instantly. The room quickly emptied, no one daring say a word, and Valerius, after making certain all had left, turned to leave himself when his Emperor’s voice stopped him. Valerius bowed deeply but said nothing, instead sitting on the cushion pointed to by his Emperor, halfway between his Prefect and his Caesar. As he made himself comfortable, Emperor Titus’ voice lowered. “As do I, my Caesar,” added Valerius. Plinius nodded his appreciation to Valerius, then returned his attention to their Emperor whose face was creased with a frown. He roared with laughter and Plinius joined him, Valerius smiling but not partaking as he knew full well that if anything were to happen to that now entrusted to his safekeeping, he would surely die. As would his Prefect and friend. For no one could resist the massive fortune now housed on his property overlooking the sea. A war chest, taken from the Empire’s treasury when Vespasian ruled, to put down any rival’s bid to the throne. Within moments the others returned, none daring show any annoyance at having been unceremoniously ejected from the lunch, an earlier than planned gathering made necessary by the ever changing schedule of the Emperor. If it were Valerius, as it had been before, he knew he too would have shown no expression that might betray his inner anger and annoyance, as it would be of no use. He had served under Plinius for the better of fifteen years and thanks to his Lord’s position had met his share of emperors, and he found they all had one trait in common—supreme arrogance. Having never met any before they had attained their position he couldn’t say whether or not they had always been that way, or if it was an acquired skill learned upon gaining the highest office in the land. All Valerius knew was that it pissed him off. And he would never show it. His Lord, Plinius, was different. Though of a far higher station than Valerius through birth, when Valerius had found himself under Plinius’ command, a young officer fresh from the academy, Plinius had taken him under his wing like a son and treated him as close to an equal as was permitted in an empire obsessed with class and caste. And through Plinius’ tutelage and care, Valerius was now a wealthy man himself with a home in Rome and a summer home in Pompeii. It is essential you pay as little in taxes as possible. It was sage advice at any time, and coming from Plinius when he had gifted his old escape in Pompeii to his underling, he had explained the importance. Hide your wealth outside of Rome, and the Senate cannot take what you have earned. Keep it in Rome, and they would soon have you parted from it. The advice, over a decade old, held true today more than ever. With the economy in recession, inflation then deflation wreaking havoc, Emperor Vespasian had tried to stimulate it through massive public works projects to keep the citizenry employed and distracted, his most ambitious a mighty coliseum that would dominate the Roman skyline for centuries to come. It hadn’t worked, instead only draining the treasury, hence the late Emperor’s desire to keep a large portion in reserve, outside of Rome, in the event of a challenge to his leadership. And it was all kept in Valerius’ basement. Gold bars filled the newly excavated underground chambers on his property tucked into the mountainside. It was impressive, and terrifying. If word were to escape, every thief and marauder in the empire would descend upon his home and the treasury hidden away from the people of Rome. It was a massive fortune worth dying for, either in pursuit of it, or defense. The room shook again, this time harder than even Valerius remembered feeling, eliciting screams from the women and yelps even from some of the seasoned soldiers. The floor cracked at their feet as dust and plaster fell from the ceiling. Valerius leapt to his feet then pulled Plinius to his, ushering him out of the house and onto the lawn overlooking the Bay of Naples, the Praetorian Guard whisking the Emperor out at the same time. The shaking soon stopped but no one noticed as they all looked across the bay at the sleeping giant that appeared to be awakening. Valerius bowed slightly, then deeply to the Emperor who said nothing, this time betrayed by his eyes. For fear was there, as it was in all of them. Mount Vesuvius had awoken, and even in the darkest reaches of their souls, none could imagine the horrors that were about to befall them all. Acton nodded, the explanation obvious once actually articulated. “Okay, so it was a stupid question,” he said, smiling. “I’m sure there’s a reason, though,” he added, his Spidey senses starting to tingle, setting off a slight adrenaline rush at the thought of yet another thing going wrong in his life. He was an archeology professor at Saint Paul’s, a small Maryland university where he had worked for much of his professional career. And his life now was far too “event driven” for him to remember what had attracted him to the damned profession in the first place. He had to admit that was the truth. He had loved those movies and even read the novels, voraciously devouring anything he could related to the character, and when he finished that, he chewed through the entire archeology and ancient history section of his limited school library. He fell in love with history. Roman history was his favorite. The great empires. Greco, Roman, Egyptian, Mongol, Caliphate. Not to mention the more modern ones, British, French, Ottoman, Soviet, Nazi and American. He was fascinated by them all, and how similar they were in nature, no matter how old or new. Empires rose, thrived, and fell. It was inevitable, and he was convinced the empire he lived in now was collapsing. Would it take a thousand years like the Roman to fall, or would it be rapid like the British. World War Two essentially ended it for them. Would one good war end it for America? Had one good war already ended it and we just didn’t know it yet? He found himself preoccupied with that thought quite often, and he hoped that with today’s knowledge of the past and our technology, along with a shared and distributed information source like the Internet, Western civilization just may avoid the hard fall that so many before had experienced, and instead might ride out the current dip. But with challengers to the throne all around, from the new economic powerhouse of communist China, to the growing powerhouses of India and Brazil, along with a resurgent and belligerent Soviet Union Version 2.0 if the West were to survive, it would need to defeat not only these external forces economically and perhaps militarily, but also the enemies from within who would destroy what previous generations had sacrificed so much to build. Whether they were immigrant and Muslim groups trying to change the way of life that created the wonderful countries they wanted to now live in, or those who would have us feel shame for actually being great countries amongst comparative cesspools, or even those who were perfectly content to sit back and live off the avails of the great Western nations while contributing nothing, all would need to be defeated. He could never understand why someone would risk everything to flee their country to come and live in one of the Western democracies, then immediately try to change their new home to be more like their old home. Acton had lost count of the number of discussions he had had with his students on the topic. They made for lively debates, and he was open to all views on the matter, as long as the arguments were civil and productive. Unfortunately he found too many times with today’s youth they had too difficult a time putting together a cogent argument, and instead resorted to insults, cursing, or complaining to some civil liberties group about the professor who challenged politically correct thinking, when in fact all he was doing was forcing them to participate in the greatest freedom of all. He thought of the movie Raiders of the Lost Ark and how in the end the government had taken the ark and hidden it in a warehouse, the wonders of the find forever lost to history except for a cameo in a fantastic sequel with a riveting story line almost thirty years later. This time the treasure they had unearthed was public. A little too public for his liking. And it was loaded in the hold of this very plane, a priceless trove worth almost a full billion dollars if simply melted down. But they weren’t conquistadors, Spaniards melting down priceless Incan and Aztec treasures merely for the metal and gemstones. They were archeologists, trying to preserve the past. And in this case it meant secrecy and heavy security, the former of which had failed miserably, thanks most likely to the completely inept and corrupt United Nations that had handled the negotiations. If there was one organization on the planet that needed a major overhaul, it was the UN. Any organization so warped as to name countries like Iran to head up women’s rights had to be shutdown. What was needed in his opinion was a United Democratic Nations, rather than a collection of dictators constantly looking for ways to make Israel look bad instead of actually furthering human rights and bettering mankind. And the permanent Security Council? Again, why should non-democracies like China and Russia have veto power? And for that matter, why should the United States? If the UN was supposed to be a democratic institution, even if its member states were not, why should there be veto power? Because you couldn’t trust the vast majority of the membership to not pass resolution after resolution impacting the democracies of the world. Though that wasn’t the original intent of the veto power—it was more to create a balance between the West and the communists after World War II—it had now become a balance between the West and the Muslim and African nations of the world, few of which were democracies and few of which gave equal rights to all of their citizens, especially women. Though half a dozen had died yesterday, he and Laura had made it out alive with a massive trove of gold the bureaucrats were concerned about though not the preserved archeological find they had hoped for. He had breathed a tremendous sigh of relief when the massive transport had taken off and left Eritrea behind. He had been a little leery however, the enormous Antonov An-124 Ruslan being insisted upon by the Eritreans, including a “non-Western” crew. Acton would prefer to be sitting in the back of a good old American C17 Globemaster with a dozen armed Delta operators surrounding him, rather than their current situation of a private Russian aircraft with private contractors at the controls and those who had survived yesterday’s attack of an unarmed group of security “observers”, two from each of the permanent members of the United Nations Security Council, along with two from Italy, the ultimate destination of the treasure they had found. But he did have to admit he felt a lot better when the two American observers had been introduced to him. Dawson and one of his Delta Force cohorts, a Korean-American, Sergeant Carl “Niner” Sung, were well known to Acton. He trusted them with his life despite an inauspicious beginning to their relationship years ago. Acton looked away from the window and was surprised to find the two seats beside him empty, Dawson and Niner walking toward the front of the aircraft. It had been configured with several dozen seats at the front for the passengers, and behind a temporary wall was the hoard of gold bars they had retrieved. Another transport with his fiancée on board had lifted off only moments before them, carrying the remains of the ship that had contained the gold and its hallowed crew, the origin of which was astonishing. In fact, he had found it almost impossible to believe when he had put the pieces together. Raised voices from the front had him focus on what was going on. Dawson was jabbing a finger toward one of the private security that the Eritreans had insisted upon, someone Dawson had identified as ex-Russian Spetsnaz. Suddenly the man stepped back and pulled a weapon, squeezing two shots off into Dawson’ chest. His body sailed backward half a dozen feet, his chest shoved back, his arms and legs stretched out in front of him like a marionette that had been suddenly yanked by its master. Acton gasped, jumping to his feet as Niner stepped forward, using a combination of moves so fast Acton’s mind couldn’t even process them, a mere split second later resulting in Niner with the man’s weapon and a round pumped into the previous owner’s head, Niner dropping to a knee and spinning to his right, firing two shots into another guard before he could react. But his weapon did, the man’s finger clenching on the trigger, firing a single round through the fuselage. Wind howled through the cabin as alarms began to blare. The plane suddenly plunged into a rapid dive, tossing all those aboard around, Acton bear hugging the seat in front of him as the oxygen masks dropped. He pushed himself back into his seat, grabbing the lap belt and fastening it, yanking it tight as he reached up for a mask. Fitting it over his mouth, he leaned into the aisle and his heart sank. The body of Command Sergeant Major Burt Dawson had tumbled forward against the front of the cabin. And as the plane continued its rapid descent, his thoughts turned to the one person he wished he was with this very moment, but thankful he wasn’t. The love of his life, Laura. He reached into his pocket and pulled out the satellite phone. With one hand pressed against the seatback in front of him, he dialed with the other. It rang several times then went to voicemail, her voice, so beautiful, the last one he would hear in this lifetime. He took a steadying breath then removed the mask from his face. Another breath, and one final thought. The plane jerked to the left, the pilot apparently losing control, tossing him violently, causing the phone to fly from his hand and bounce along the left wall of the fuselage toward the front of the plane. He battled to straighten himself, finally succeeding, their angle now giving him a clear view of the ground below, and the impossibly close road that had only minutes before seemed so far away. He closed his eyes, gripping the arms of his seat hard, his mind filled with only one regret. A regret that at this moment seemed terribly selfish. And as the engines whined, the cries of some of the passengers competing with the turbines, he thought of all the heartache that was about to be caused. As Pompeii claimed its last victims. Plinius, standing on the veranda he hadn’t left since the Emperor departed for Rome, turned to see his young nephew, Gaius, emerge from the house, scroll and stylus ever present. Plinius extended his hand and the young man took it, standing beside his uncle. They both stared across the bay at the sight before them. The ground continued to shake, the frequency making the pauses between tremors almost unnoticeable, and the sky across the bay continued to darken, far too early for this time of day. Across the water the mighty Vesuvius continued to spew its innards skyward, a straight plume firing high into the sky then outward, like a tall palm tree, whatever it was ejecting eventually falling back down to earth in all directions. Plinius looked at his nephew, a mere seventeen years old, and already about to begin what he was certain would be a successful legal career. His gaze returned to the plume that now dominated the horizon. Plinius put his arm around his young protégé, he himself a dull yet successful lawyer for many years while the dreaded Nero held the throne, during which it was best to keep a low profile lest the head that stood above the crowd be lopped off in one of his tantrums. When Vespasian had finally won the throne during the civil war, or as it had become known, the Year of the Four Emperors, Plinius had reemerged, eagerly sought after by the emperor as a man he could trust that was also capable. It had eventually resulted in him being named Prefect of the Fleet, and his station here in Misenum. As he gazed out at the harbor housing the dozens of vessels at his command, he quickly came to a decision. Plinius smiled, knowing his nephew was right. Charging into the midst of this curious phenomenon was probably foolhardy, but curiosity was always one of his weaknesses. He knew Gaius was incredibly curious as well, but he also knew his mother would never allow him to head toward the danger regardless of whether or not his uncle was foolish enough to do so. “Understood, Uncle,” said Gaius with a slight bow. And as if to emphasize the point, the ground jerked suddenly, knocking them both off their feet. Birhan absentmindedly swatted at the flies competing for access to his rotting teeth. They didn’t bother him, and if any got in and were eaten, so be it, his stomach welcoming any nourishment, no matter the form. He tapped his cane on the ground at one of his herd that was straying from the road, the goat’s bleat of protest preceding a leap back into the group. Birhan chewed on his khat, it’s mildly stimulating effect keeping him alert, the near constant habit making him numb to the reality of his existence if he went without. For that’s all it was, though he knew little better. Existence. His wife was dead years ago from famine along with five of his six children, his only remaining child a daughter he couldn’t marry off, a dowry so far out of reach it wasn’t even a dream. He had arranged to sell her two years ago, the burden of providing for her simply too much, but she had begged him not to, and once he had met the beast of a Saudi that was looking to purchase some of the village’s girls, he had backed out of the deal, realizing he’d be unable to live with himself knowing such a man would be bedding down his daughter against her will. Feeding two mouths was difficult, especially off the small percentage of the seasonal profits he was paid by the land owner whose heard he tended, but it was nice to have someone at home at the end of the day to prepare the miserly meals and keep the humble single room home they lived in clean and tidy. Abrihet was a good girl, though not terribly attractive, the poor girl cursed with his looks rather than her mother’s. Which meant she would be doomed to a lonely existence unless he could find some way to come up with a dowry so one of the men of the village would find it worth their while to take her on as a wife. And it would have to be soon, she getting older by the minute. A bleat behind him had him spinning, the khat having him on the razor’s edge of giddiness. A goat had somehow been left behind. He cursed and shuffled after it, the creature disappearing over the nearby embankment. As he climbed the rise he paused a moment upon reaching the top, taking in several deep breaths and enjoying the sight of the Tekezé River below. On the other side of the river marked Ethiopian territory. Birhan spat on the ground at the mere thought of their enemy. He had lost many friends and relatives in the war, but fortunately for him he was too old to fight. Sighing at the thought of why anyone would fight over desert, he spotted the runaway about twenty paces away. Clicking at the creature, he rounded it from the opposite side of where he wanted it to go, then gave the cane a flick, the snap as it smacked the ground had the creature rushing back toward the herd, and Birhan following. His foot stubbed something in the sand, causing him to pause and wince in pain. He knelt on one knee and moved some sand aside. An old, dry piece of wood was revealed. He was about to dismiss it when rivulets of sand began to slowly cascade down the hill toward the river below, revealing more of the piece of wood he had just stumbled upon. The piece of wood was curved, like the hull of a boat might be. A jolt of excitement raced through his worn body at the thought of his daughter’s dowry possibly being buried right here, underneath the sand he walked by on a daily basis. He quickly swept away more of the sand, revealing more of the buried wood, and within minutes there was no doubt that this was a buried boat, and if it were seaworthy, it was a boat he could sell in town and provide the money necessary to marry off his daughter so she could begin her life. The thought caused him to pause, but he realized that he must continue, his selfish moment never to be mentioned, her happiness all he was concerned about. As he cleared more and more of the sand away, he began to realize how massive the boat was, and glanced over his shoulder at the river, easily several hundred paces away. How did they ever drag it here? The thought it had been brought here during a flood only to be scuttled on the shore had his chest tightening as his heart began to sink, the next curved board broken only several feet into its sweep along the prow. After several more minutes of digging, it was clear that this boat hadn’t been seaworthy in a long time, nor would it ever be again. He dropped down on his haunches, exhausted from the effort, and disappointed that he wouldn’t be able to see his daughter with child any time soon. He tossed a small stone into the gaping hole in the side of the boat and froze as it pinged off of something inside. He crawled over and stuck his head in the hole in search of possible salvage. Perhaps a dowry is still possible! He would have expected anyone who had abandoned the vessel to have emptied it of anything valuable, but perhaps what was worthless to them may not be to him. Something glinted and he reached forward, grabbing a hard metal object. Pulling it from the hole and out into the sun, he suddenly felt lightheaded with excitement. Gripping the small metal rectangle in his hands, he held it up to the sun then kissed it. And thanked the goat responsible for changing his life forever. Valerius picked himself up off the floor, dusting himself of the ash that seemed to cover everything. Silks and blankets had been hung over all the windows and doorways in an attempt to keep the ash out, but the wind that seemed to howl down from the mountain kept a steady stream of servants busy as they tried to find ways of sealing the openings. Screams and wails from outside weren’t stopped by mere silks, however, and Valerius found himself from time to time peering out into the darkness, it now barely mid-afternoon, to glimpse the hell outside his walls. And on each peek, it seemed another arm’s length of ash and pumice had fallen, a steady rain of small stones, still glowing from the cauldron that was now Vesuvius, continuing to rain down on the city, setting light to anything not made of stone. The streets were filled with those trying to escape, and if it weren’t for his charge buried on his property, he would leave himself, taking his precious family to safety. But he couldn’t. He couldn’t abandon his duty. And his duty would surely mean the death of his family. He turned to his most trusted slave, Costa, who hadn’t left his side since the horror had begun. The ground shook again and a column nearby cracked, a large sliver of marble breaking away and shattering on the floor. Both looked at the ceiling with unease, then Valerius turned back to Costa. Labeo bowed then left to execute his orders. Valerius returned to the window, pushing the curtain aside and looking at the mighty Vesuvius in the distance as it continued to belch ash and stone into the air, the entire sky now blackened as sheets of lightning raced across the rippling canvas of grays and evil. He turned and peered toward the sea, it barely visible despite being only several hundred paces away. Stepping back from the window, he repositioned the curtain and took a drink from the goblet clutched in his hand since the air had become thick and difficult to breathe. He turned to see the staff assembled, patiently waiting for him to acknowledge them, but fear written across every face. They were men, women, children. Freemen and slaves. Husbands and wives, mothers and fathers. They were average everyday people with their own troubles and joys and responsibilities. And not one had abandoned their post. He turned back to the window, moving the curtain aside slightly as he listened to the foot falls slowly dwindle behind him, then nothing. He turned and started, his eyebrows shooting up as he saw almost a dozen of his staff still standing, now side by side in a row, four women and eight men, including Labeo. The others all stepped forward, as synchronized as any combat troops he had ever commanded, and his heart surged with pride in the honor and courage being displayed before him, and albeit selfishly, in himself, knowing he could command such loyalty and devotion in the face of overwhelming odds. He bowed slightly. “You honor me, and it will not be forgotten.” He looked to Labeo. “Prepare two carts to carry my family to safety. Bring the horses inside the house so they can breathe. Load water and food for a journey of two days plus blankets and cloths to protect everyone from the ash. Remember to take extra water in case you need to put out a fire and to quench heavy thirst from whatever this is,” he said, wiping some of the ash off a nearby vase with his finger. “Immediately, sire,” said Labeo, bowing, then rushing out of the room with the others in tow. Valerius strode through his large home, it feeling empty now, his footsteps echoing off the marble, and found his wife, Avita, in their bedchambers spinning in a dress he hadn’t seen before. His eyes darted to her neck, a large ornate necklace, a gift from Plinius upon their marriage, adorned her powdered white skin along with bracelets, rings and earrings of ridiculous proportions. Her voice was low, almost a growl. He removed his hands from her arms, more out of curiosity as to what she would do next than any sense of obligation. She stepped over to a table filled with the accoutrements of female beauty and picked up a polished copper mirror, examining herself. The mirror clattered to the floor and tears erupted as she collapsed into his arms, her shoulders trembling, the shaking of the room going unnoticed. “I’m sorry, darling, I-I don’t know what came over me.” She looked up at him, her tears having burned tiny rivulets through her chalk powder revealing faint trails of her lightly bronzed skin underneath. Never afraid of a hard day’s work, she was darker than high society would like, but she rarely paid it any mind, her natural beauty more than enough to make those who would criticize behind her back dismissed as jealous.